I'm always delighted with your designs and they always work out beautifully. Beth created this fun and bright quilt using the Doodle Bug set. Shirley sent in this stunning doodle bugs ribbon dress - what a beautiful model too! Margarets quilting group made this wonderful quilt for the McDonald House Charity. What a special gift for a child in need. Ginger from a Mum and Two Boys also created this lovely blanket! Stacie made this bright and fun baby set with Doodle Bug and Love Letter designs. Stacie also sent in this blanket set - the blanket features a butterfly from the Doodle Bugs set and the Frivolity Alphabet. Melanie designed this darling doodle bugs dress for her granddaughter - I just love the ribbon added! Melissa sent in these sweet pillows she made with the Doodle Bug designs. Carole made this super quilt using Bunnycup Designs and Sue Box designs in the center panel. Peggy sent in this darling quilt that she made titled Girls Gone Buggy. Just too adorable! Patti made this ever so cute outfit for her darling granddaughter. What an adorable model! Christi sent in this darling picture of a bib set made with our popular Doodle Bugs Designs! Cute! Christi sent in this darling dress set made with Doodle Bug designs. Kyra sent in these darling burps, bibs and blanket she made using Doodle Bugs designs. Lyn sent in this darling baby blanket she made with Doodle Bugs designs. So beautiful! Paige sent in this darling dress she made with Doodle Bugs. Paise has a wonderful website so be sure to have a look. Barbara sent in this picture of a very cute nappy she made using Doodle Bugs designs. Charlotte sent in this stunning onsie she made using a Doodle Bugs design. Charlotte has a wonderful website so be sure to visit. 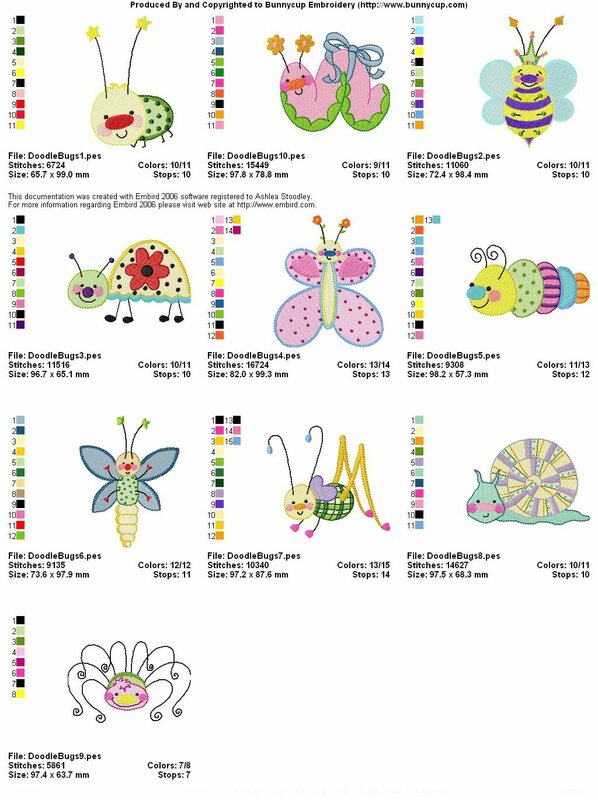 Margaret sent in these darling pictures of quilts she made with Doodle Bugs and Doodle Bugs Too designs. Jennifer sent in this picture of a darling baby's set she made using a Doodle Bugs design. Jennifer has a great blog too - so be sure to have a look! Leticia sent in this picture of a sweet towel she made using The Styx, Doodle Bugs, Yummy and Whimsy Alphabets designs. Leticia sent in this picture of a cute towel she made using Whimsy Alphas, Doodle Bugs and Yummy designs. Melody sent in the picture of an adorable woolie she made using a Doodle Bugs design. Celine sent in this picture of two very cute snuggle blankies she made using Doodle Bugs and Beary Flutters designs. Celine has a wonderful shop so be sure to have a look.